MULTAN, Jan 24 (APP): Prime Minister Muhammad Nawaz Sharif Tuesday said the Pakistan Muslim League was making the real “New Pakistan” by undertaking mega development projects to serve the masses. Addressing a large gathering after inaugurating the Rs 28 bln, 18 km long Metro bus project for Multan, the third city in Punjab to get a modern public transport network, Sharif said he believed in delivering real projects for the people and did not believe in selling half-baked ideas, for petty political gains. Prime Minister Nawaz Sharif said the gathering here today was not for any sit-in, to disrupt any development project, block roads or level baseless allegations, but was here to unveil a development project for the masses. He said those who claimed of building a new Pakistan should come to Multan to see in reality the new Pakistan. He said the city would soon be linked to the modern motorway network of the country that would help further boost the national economy. Sharif said a new Expressway would also link it to Faisalabad and onwards to Islamabad in almost half the time. He said another six-lane Multan-Sukkur link would connect the city to Karachi soon. Prime Minister Sharif said a network of roads was now connecting all remote areas of Balochistan and would make travel safe, easy and cheap. He said all provinces would be connected through new road links. He said only those who have no idea about progress and development of the country were distracting the nation daily through baseless, unfounded accusations. He said the religion also forbids levelling of accusations against others, particularly on issues on which they do not adhere themselves. He said the days were not far of when the people of Pakistan would find the reality of such people. Prime Minister Sharif said by the end of this year 10,000 MW would be added to the national grid, and said it was unprecedented progress only in a short span of three years of the PML-N government. He said Pakistan has never produced more than 15,000 MW in the past. He said the government has spent Rs 110 billion for acquisition of land for the Diamir Bhasha dam alone and said once completed it would generate 4500 MWs and said soon the days of power outages would be over. He said the tariff for power would also be lowered to pass on the benefits to the people. The Prime Minister said soon Prime Minister’s National Health Insurance Scheme would be launched for Multan to help the poorest of the poor pay for expensive medical treatment on government expense. He said the poor families had to sell away all their possessions to pay for medical treatment in the past, but now no more, as the government would pay for it. The Prime Minister congratulated Chief Minister Punjab Shahbaz Sharif and his team for completing the project in minimum possible time of 18 months and termed it a highly laudable step. He hoped rest of the project would be completed at the earliest. 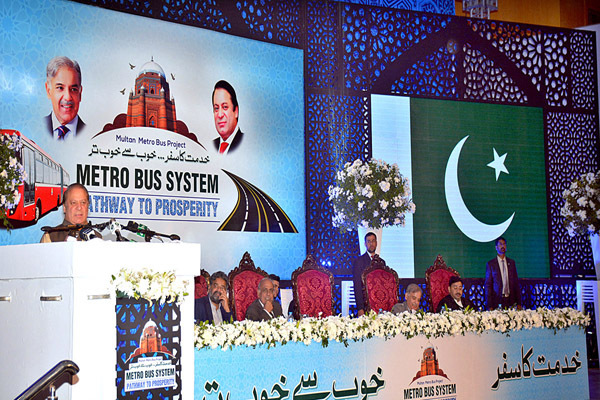 Nawaz Sharif said the Metro transport system was the best possible service for the people of Multan. He said there was a suggestion for doubling the fare in Multan from Rs 20, however he quashed it and said the government would subsidize the travel. He said the government would incur a cost of billions to benefit the masses, but it was nothing when compared to the ease of transportation for the masses. Chief Minister Punjab Shahbaz Sharif said the project was part of vision of Prime Minister Nawaz Sharif in which he believes that roads and communication networks were the key to success of every nation. He said it would help in spread the pace of progress to every nook and corner of the country, save time and enhance economic activity. Shahbaz Sharif said even the critics of the Lahore-Islamabad motorway now acknowledged its benefits. He said Rs 4.5 bln were spent on the acquisition of land for the project out of Rs 28 bln cost of the project. electricity, storing water, building roads and infrastructure. Shahbaz Sharif said the completion of the project has put an end to all the speculations about the commitment of the government to the uplift of the South Punjab. He regretted that the opposition on the other hand has done little but to set up rumour mongering factories that were churning out nothing but baseless allegations. He categorically stated that the government was completing the projects with full transparency, without even a penny of corruption. He said it was time that those who were trying to hide behind the Panama issue, should stop deceiving the people and start acknowledging the development works undertaken by the PML-N government. Minister for Food Security Sikandar Hayat Bosan said the project has put the city and surroundings on path of development and progress and termed it a gift by the Prime Minister and Chief Minister Shahbaz Sharif for the people of South Punjab. He also lauded them for the revolutionary package for the agriculture sector and said the farming community were very pleased to get the incentives. Mayor Multan Naveed Arain and others also spoke on the occasion.